This documentation describes the ESP32 Evalulation board as part of the Embedded Board Builder (EBB) familiy from Makerfactory. 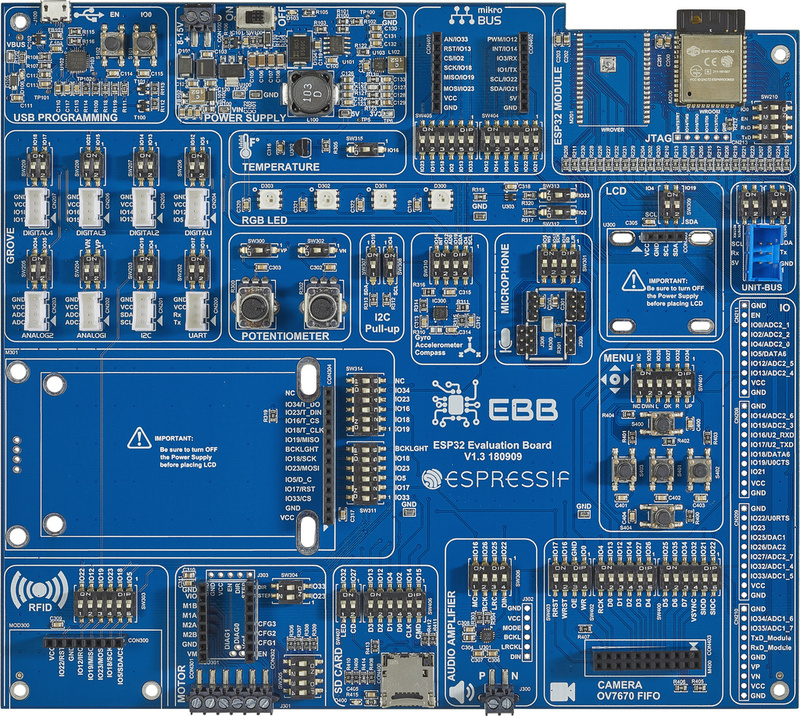 This board is an an devleopment board for the ESP32 module from Expressif Systems. With this development board you could develop projects for the ESP32-WROOM-32 (for more information check the datasheet on the page of Expressif Systems) or ESP32-WROVER (for more information check the datasheet on the page of Expressif Systems). The screenshots are created with the english version of Windows 10. If screenshots completly differs from the Mac OS version it's mentioned in the text. The following picture shows the ESP32 Evaluation Board in Version V1.3. The ESP32 module has a limited number of usable IO ports. It's not possible to use all components on the board to the same time. Therefore you have to decide which component on the evaluation board you want to use in your project. In order to use a component you have you switch the appropriate dip switches to on. Additionally you have to switch conflicting components to off. The components which are using the same IO are described in the component pages. Download the schematics of the evaluation board if you need deep information about the structure of the board. The schematics could be found here. Copyright © 2018 Conrad Electronic SE.